Sitting along the banks of the Fighting Town Creek, a Trophy Trout Fishing Stream, Watersound Cabin is the perfect cabin for rest, relaxation, and of course some FISHIN! Sit on the banks of the creek and let the rushing water sounds whisk your cares away. The open living/dining/kitchen with a large stacked stone, wood burning fireplace and vaulted wood beamed ceilings is the perfect spot for the family to gather. The kitchen has stainless appliances and is equipped with everything, even a dishwasher, you will need to prepare that perfect meal. The tastefully decorated living room has a beautiful plush sofa and several chairs, a flat screen TV with Dish Network and Free Wi-Fi. From the living area you can access the screened in porch overlooking the beautiful stream. Perfect for a romantic weekend or a family adventure the cabin has two bedrooms and 2 bathrooms to comfortably accommodate 4. On the main level of the home is a king bedroom, a full bath with shower/tub combo and access to the screened porch. The second king bed is located in the loft, a full bath with shower only and a private balcony to sip your morning coffee while listening to the sounds of nature. Being outside in the North GA Mountains, well that’s the place to be, but being at Watersound Cabin makes it even better. A Fire-Pit, Horseshoe pit, Charcoal Grill and an open deck over the creek are just a few of the outdoor amenities you can enjoy on your vacation. 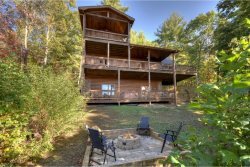 Located just minutes from the quaint mountain town of Blue Ridge GA and the unique twin cities of McCaysville, GA and Copperhill, TN, this is a GREAT location for those who want to experience everything in the mountains. The outdoor activities are endless where Hiking, Kayaking, Tubing, White Water Rafting, Paddle Boarding, Horseback Riding, and Zip-lining are all right at your fingertips. You can hike to several Waterfalls, hike to the Swinging Bridge, or take a more relaxed approach and enjoy a great meal at one of the many wonderful restaurants or breweries. Don’t forget to take a ride on the Blue Ridge Scenic Railway, be entertained at the Big Foot Museum or step back in time at the local Swan Drive-in Theater. There is something for everyone in the mountains! All of our cabins include linens, dishes, silverware, pots & pans, towels, wash clothes, and we will provide an initial supply of guest soaps, toilet paper, dishwasher detergent, paper towels and trash bags. For an extended stay we suggest you bring a supply of toilet paper, paper towels and laundry detergent. If inclement weather (snow/sleet/thunderstorms) is in the forecast during your stay you may want to bring flash lights, extra toiletries, diapers and other necessities should a power outage take place.